I’m not an aviation specialist, not even a real aviation buff, but I’ve come to like planes more than a non-pilot. Unexpected circumstances (the discovery of a letter in a small museum in Montana) have led me to write a novel with a background of aviation and WWII, The Legend of Little Eagle. And I fell in love with the North American P-51 Mustang, model D, which remains nowadays one of the most beautiful fighters ever built. My hero, 18 year old First Lieutenant John Philip Garrau, flies one over Germany and France in 1944. He will have a heroic, tragic fate. Conceived as a long range fighter, the P-51 D arrived in Europe in March 1944 and played a major role in the subsequent bombing campaigns of the 8th Air Force on Germany (great book here.) It was fast (700 km/h), highly manoeuvrable, with six 12,7 mm. machine guns, and could be equipped with ten 127 mm. rockets (mainly for strafing). More than 8000 51-D were produced in Inglewood (CA) and Dallas (TX) at a price of 50 000 $ per unit. I don’t know how many of them remain today, but an original Mustang in good condition sells between 1,950 000 and 2,500 000 $. If you ever dreamed to own one but are a bit short of money, a Czech firm offers a nice 70% scale replica for close to 100 000 Euros – excluding taxes. 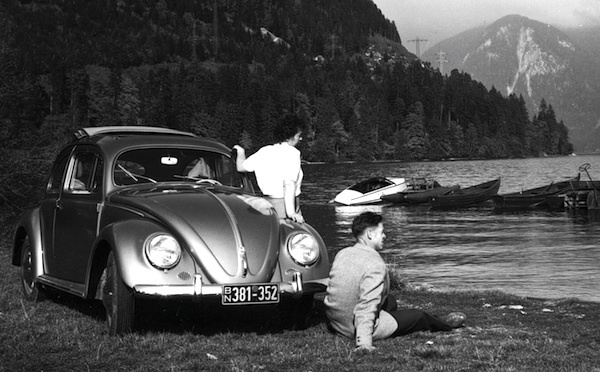 As I was thinking about that the other day, I suddenly remembered a full page ad that Volkswagen ran for a long time in Swiss newspapers (I live in Switzerland): a small, plain picture of its Beetle, and, in very big characters, its price: 5555 SF. That was, I think, around the late 50’s. All right, even though the value of the almighty dollar had began its long and steady slide, the Beetle was actually cheaper than the Mustang. Le dollar and the Swiss franc being roughfly on par today, let’s say that 4000 $ of 1945 could have bought a 25 000 $ Passat today. But many of the P-51 D which had been in service after 1945 and until the mid 50’s were sent to scrap to be replaced by jets. What a waste, would the warbirds lovers of today say ! If only we’d been there. There were bargains to be made. My first three cars were Beetles. I never dreamed about purchasing a Mustang plane (though I did dream acquiring a Ford Mustang car, oh yes ! ), even the Czech replica. But I love to watch pictures of Mustangs and read about the famous pilots, aces and heroes who flew them, like Chuck Yeager, and I love those planes better today than the Beetle yesterday. Ce contenu a été publié dans Aviation et pilotes, The Legend of Little Eagle, Tout le blog, avec comme mot(s)-clé(s) Mustang prices, novel, P-51 Mustang, pilots, The Legend of Little EagleBeetle, WWII. Vous pouvez le mettre en favoris avec ce permalien.